The recently opened, Yu Kitchen is clearly catering to the cravings of Columbia University’s international students for home style Chinese food, rather than to the old school Upper West Side residents who grew up on the American-Chinese food that used to dominate this neighborhood. There is no Sesame Chicken at Yu Kitchen, but the is Pita Bread soaked in Beef/Lamb soup with Sweet Garlic and Xi’an Meatballs with White Pepper Soup. Yu Kitchen specializes in Northwestern Chinese cuisine, with a menu that includes hot pots, handmade dumplings and wontons, and a huge selection of homemade noodles and rice. I have written about this trend of more authentic regional Chinese restaurants opening in Manhattan Valley, but this is not a net gain for the neighborhood as Yu Kitchen opened in the old Lava Kitchen location. While Lava Kitchen was a basic counter service joint, Yu Kitchen is a full service restaurant with tables and booths. The Dumplings: The dumplings and wontons at Yu Kitchen are all house made and you can choose from: Cabbage & Pork Dumplings; Shrimp, Pork & Leek Dumplings; Chicken Dumplings; Vegetable Dumplings; Fish Dumplings; Beef Dumplings; Celery & Pork Dumplings; Xi’an Beef Dumplings in Sour Spicy Soup; Chong’s Pork Dumplings with Spicy Sauce; Pork Wonton Soup; Shrimp & Pork Wonton Soup; Spicy Pork Wonton; and Spicy Sour Pork Wonton. The basic dumplings come steamed but for an extra dollar they will pan fry them. 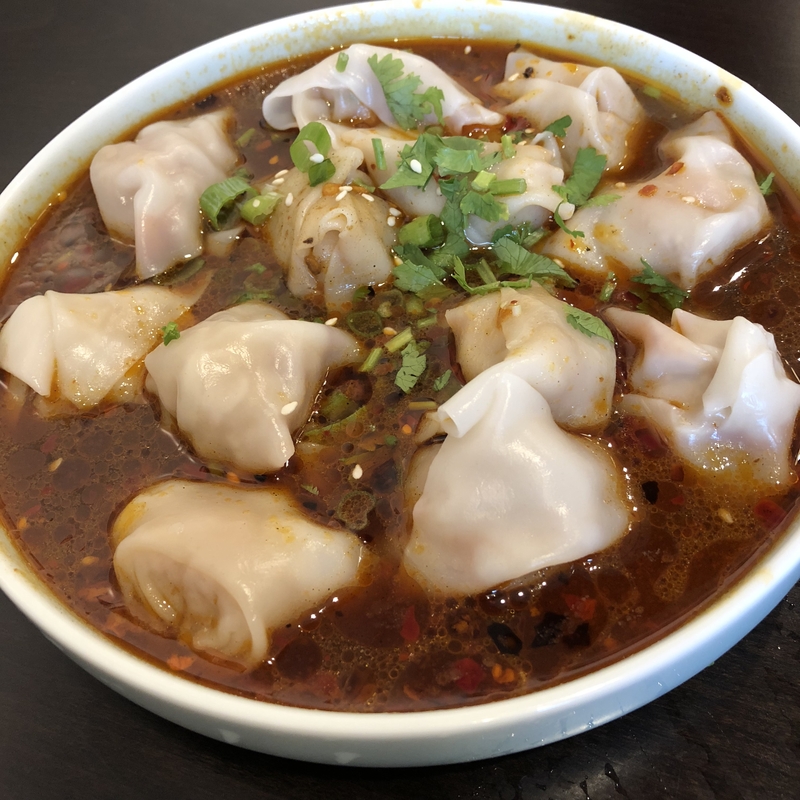 Spicy Sour Wonton – The Spicy Pork Wonton and Spicy Sour Pork Wonton are not Szechuan style wontons in red chili oil, but rather are served in a light broth seasoned with chili oil, pepper, scallions and cilantro. The sour version has a glug of vinegar added to the basic spicy broth. The thin slippery wontons were generously filled with flavorful, savory minced pork but the broth was a little too light; I would have preferred a stronger spicy and sour kick. This dish is similar to the dumplings in hot and sour sauce served at Xi’an Famous Food, but the sauce at Yu Kitchen is less intense. 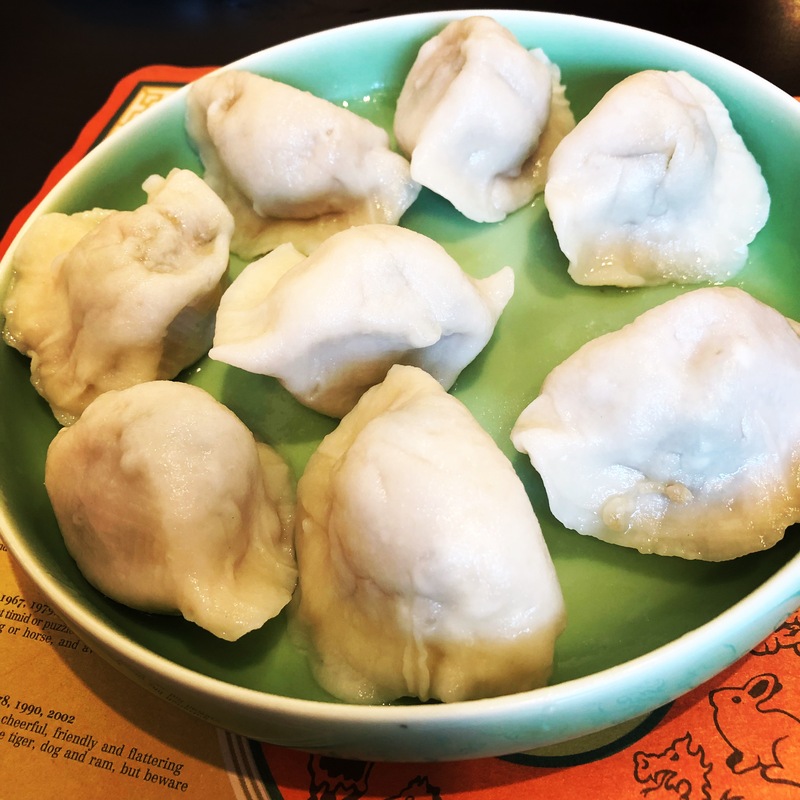 Shrimp, Pork & Leek Dumplings – I got the steamed preparation of these dumplings and they were excellent. The pork filling was coarsely ground with big chunks of shrimp and a lot of chopped leeks mixed in. The balance of the filling ingredients was perfect, the pork and shrimp each made discernible contributions to the texture and flavor – smooth, fatty, and umami from the pork and crunch, sweetness and touch of brine from the shrimp. The dumpling wrappers were thin and delicate but held up to the steaming and kept the filling tightly packed. I will be trying some more of their steamed dumplings soon. 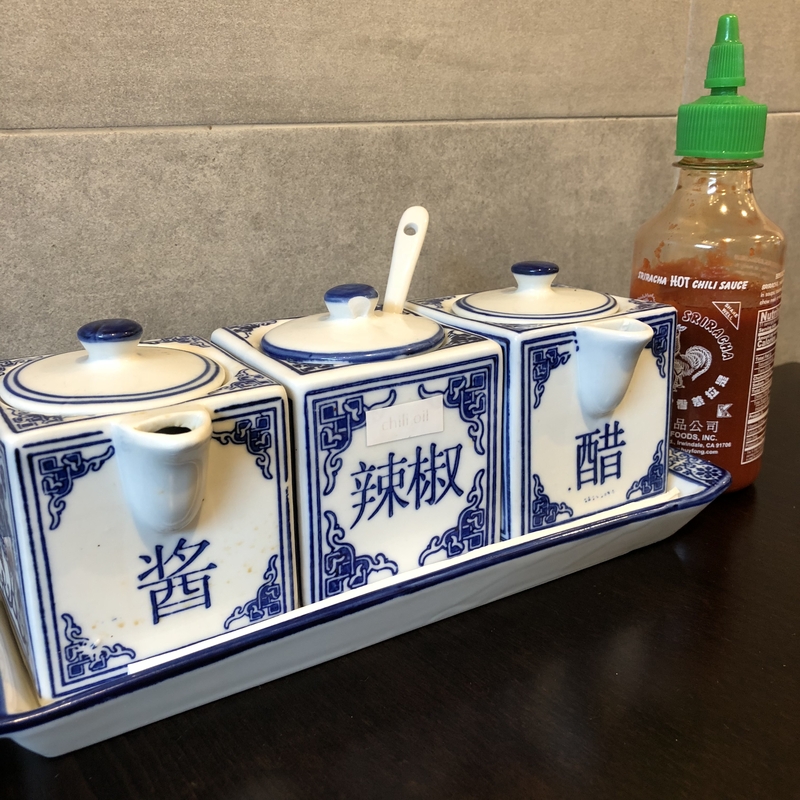 The Dipping Sauces: Each table comes with a bottle of Sriracha sauce and a cute trio of china pots filled with sauce ingredients: soy, chili oil and black vinegar. The Location: Yu Kitchen is on Broadway between 100th and 101st streets in what was previously known as the Manhattan Valley neighborhood. I have been away from the neighborhood for a couple of months and apparently in the meantime the area has been re-branded as the Bloomingdale neighborhood. I guess gentrification is coming to the neighborhood. This entry was posted in Pork, Shrimp, Wontons. Bookmark the permalink.